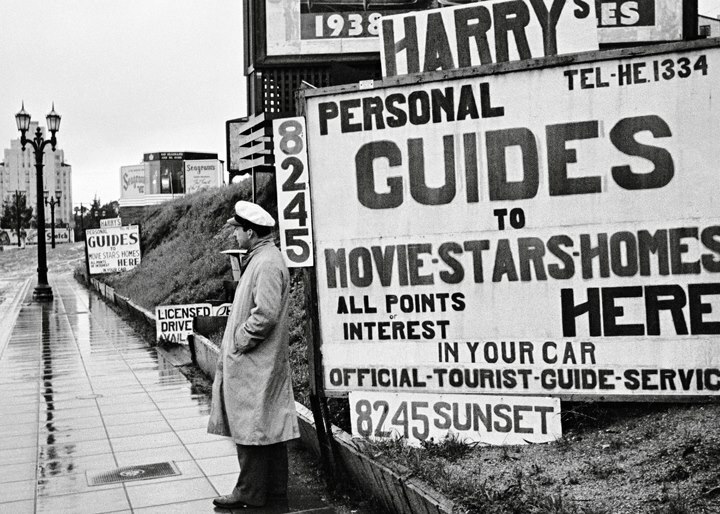 This is a rare shot of the Sunset Strip taken in 1937, from Taschen’s new Los Angeles, Portrait of a City. The tour guide is standing at 8245 Sunset [map] — that’s the Sunset Tower ahead in the fog — so if the shot were wider, to the left in the near distance you’d also the backs of the homes of two actual movie stars — Wallace Reid and W.S. Hart (whose homes faced DeLongpre Avenue, which runs parallel to Sunset in the 8300 block).